Well Sefton is a collaborative programme that is working to improve the health and wellbeing of the people living and working in Bootle by creating a vibrant and connected community, living in a more pleasant environment. The collaboration is made up of Living Well Sefton, Regenerus, Safe Regeneration, Sefton Council and YKids. Volunteers from YKids will be found at Bootle Market from 9.30am to 1pm on Friday, April 27 where they will be handing out vouchers for a free drink at North Perk, positivity pouches and offering free face painting. Groups of community gardeners from Regenerus’ Taking Root in Bootle project will be creating wooden planters with plans to distribute them around the local neighbourhood to brighten up the area. The team will be planting up and gifting at South Park on Friday from 10am to 12pm. Living Well Sefton will be working with the Orrell Trust, Venus and the May Logan centre to facilitate a raft of activities to promote random acts of kindness this week. SAFE Regeneration will be using Pay it Forward Day to build on its ‘Green Dream’ environmental work. The focus will be on creating more habitats for local wildlife by distributing wildflower seeds to local community groups. 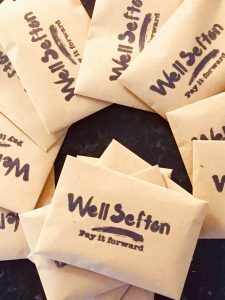 Matt Ashton, Well Sefton lead and Director of Public Health for Sefton and Knowsley, said: “Pay it Forward Day is an opportunity for the Bootle community to truly come together and make acts of kindness something that happens throughout the year. While Well Sefton’s activities will be based in Bootle, there will be lots of random acts of kindess taking place in the north of the borough thanks to Sefton CVS. To find out more about the activities taking place check the hashtag #PayItForwardSefton or follow the Well Sefton Twitter Moment.